As a member of UCount Rewards you will enjoy a host of benefits and rewards as our way of thanking you for banking with us. Here we answer some of your most frequently asked questions about the programme. Who is eligible to register for the UCount Rewards programme? The programme is available to all Standard Bank customers who have a personal transactional debit, cheque and/or credit card account which is in good standing. Will minors be eligible to register for the UCount Rewards programme? Yes, minors will be eligible to register for the programme, however this can only be fulfilled at your nearest branch and parent or guardian consent will be required. Are business customers eligible for the UCount Rewards programme? No, business customers are not eligible for the UCount Rewards programme. Can Standard Bank staff join the UCount Rewards Programme? Yes any Standard Bank staff member can join the UCount Rewards programme. How do I register for the UCount Rewards programme? You can register by calling the UCount Rewards Contact Centre on 0860 82 68 68, by visiting any Standard Bank branch, or online here. How much does it cost to be a member of UCount Rewards? There is a membership fee of R24 monthly, or R288 a year, payable by debit order from a Standard Bank transactional account only. Why is my first debit order amount higher than R24? UCount charges the first debit order on a pro-rated basis. The amount will depend on the time of the month when you register and your selected debit order date, as there may be days when you are on the programme where your first debit order has not run. If you change your debit order details in terms of the frequency of the debit order and/or the day of the debit order, this may impact the first debit order after the change. This may require pro-rated fees to adjust to the new period. UCount Rewards membership fees are charged in advance for the month and they will cover you from the day you register to the day before your debit order runs. Does the pro-rated fee only apply to monthly debit orders? This fee applies to both monthly and annual debit orders. The UCount Rewards debit order can only be loaded against your Standard Bank personal account, no payments from the accounts of third parties will be allowed. Yes, you will be allowed to change your debit order frequency (monthly or annually), debit order date or debit order account number by phoning the UCount Rewards Contact Centre on 0860 82 68 68. What is the difference between a debit order and a stop order? A debit order is an instruction from a customer to the bank for a series of payments which constitutes a stated amount to be made on a cycle date specified by the customer to a loan account. A stop order is an instruction from a customer to the Bank that holds the transactional accounts for a series of payment which constitutes a stated amount to be made on a cycle date specified by the customer to a loan account. What happens once I have successfully registered as a UCount Rewards member? You will receive a welcome SMS confirming your registration within 24 hours of joining. If you have registered with an e-mail address, we will send you a welcome e-mail detailing how the UCount Rewards programme works, together with the programme terms and conditions. A separate letter containing your UCount Rewards Card will be sent to you by post. Should you register for the programme and not provide an email address, your full welcome pack will be sent by post. Included in your welcome pack is a welcome brochure, your UCount Rewards Card and the terms and conditions for the programme. Please allow 21 days for the delivery of your welcome pack. If you do not receive your welcome pack via email or the post, please contact the UCount Rewards Contact Centre and we will arrange for a new Welcome Pack to be sent to you. What is the UCount Rewards Card and what is it used for? The UCount Rewards Card is a pre-paid debit card which can be used to redeem your rewards points at our Participating Rewards Retailers, Participating Redemption Retailers such as the Bidvest Premier Airport Lounges in South Africa, and at participating Caltex fuel forecourts. Where can I use my UCount Rewards Card? Your UCount Rewards Card can only be used for redeeming rewards points at our Participating Rewards Retailers, Participating Redemption Retailers, and at participating Caltex fuel forecourts. Do I need to swipe my UCount Rewards Card before I swipe my Standard Bank card to collect Rewards points? No, you only need to swipe your UCount Rewards Card when you are redeeming your rewards points. Can I use my UCount Rewards Card to withdraw cash from an ATM? No, you cannot use your UCount Rewards Card to withdraw cash, make transfers or get balance enquiries at an ATM. Can I use my UCount Rewards Card internationally? No, your UCount Rewards Card can only be used at Participating Rewards Retailers, Participating Redemption Retailers, and at participating Caltex fuel forecourts in South Africa. How do I report a lost or stolen UCount Rewards Card? Contact the UCount Rewards Contact Centre immediately on 0860 82 68 68, 24 hours a day, 7 days a week. During office hours you will be transferred directly to a consultant who will assist you to cancel your UCount Rewards Card. After hours, the UCount Rewards Contact Centre’s Interactive Voice Response system (IVR) will give you the option to report your card as lost or stolen. You will then need to phone again during working hours to request your replacement card. Alternatively, you can simply order a new card online. How do I get a new UCount Rewards Card? You can order your replacement card by calling the UCount Rewards Contact Centre on 0860 82 68 68 or by logging on to the UCount Rewards website. The card will be posted to you. You will need to activate the UCount Rewards Card either online on the UCount Rewards website, or via the UCount Rewards Contact Centre. What do I do if I would like to dispute a UCount Rewards Card transaction? You must contact the UCount Rewards Contact Centre and report the disputed transaction/s immediately. It will take approximately 45 business days to investigate the dispute. Is there a limit as to how many points I can redeem? Can I collect rewards points when using my business debit, cheque or credit card? No, only personal cards are eligible to collect rewards points. Do I collect rewards points on purchases paid for with my SnapScan mobile app? SnapScan transactions are considered everyday purchases, this means that you will be able to only collect up to 1.25% back in rewards points for purchases paid for using the SnapScan mobile app linked to a qualifying Standard Bank personal debit, cheque or credit card. How often will my rewards points be credited to my UCount Rewards account? Rewards points will be allocated retrospectively and credited to your rewards account at the end of each month. Example: rewards points for purchases made on the 16th of January to the 15th of February will be allocated to your rewards account on the 28th of February. A fixed cycle is from the 16th of the month to the 15th of the following month. Do rewards points ever expire or become invalid? All rewards points collected are valid for five years from the date of issue. If you do not redeem your rewards points before this time, they will expire. We will tell you in advance what portion of your rewards points balance will be expiring. You will not be able to redeem your rewards points collected if any of the products you hold with us are not in good standing. If your rewards points expire during this time, they will be lost. Where do I redeem my collected rewards points? By logging onto the UCount Rewards Online Mall or Travel Mall using your username and password. By swiping your activated UCount Rewards Card at any of our Participating Rewards Retailers, Participating Redemption Retailers such as the Bidvest Premier Airport Lounges, or at participating fuel forecourts. Can I convert my Rewards Points to air miles? How do I Redeem my Rewards Points into my PureSave account? You can Redeem a minimum of 20 000 Rewards Points (R2 000) into your PureSave account on the UCount Rewards Online Mall. You will only be able to Redeem in value increments of 20 000 Rewards Points (R2 000). The Rand value may take up to 3 business days after redemption to reflect in your PureSave account. You can Redeem a minimum of 2500 Rewards Points (R 250) into your Notice Deposit account on the UCount Rewards Online Mall. You will only be able to Redeem in value increments of 2 500 Rewards Points (R250). You can open a Notice Deposit account via Internet Banking by clicking on the “Apply for Account” tab and then select “Savings and Investments” then select “Notice Deposit”. You can choose any notice period between 7 days to 60 days. How do I Redeem my Rewards Points into my AutoShare Invest account? You can Redeem a minimum of 2500 Rewards Points (R250) into your AutoShare Invest account on the UCount Rewards Online Mall. You will only be able to Redeem in value increments of 2 500 Rewards Points (R250). You can open an AutoShare Invest account via Internet Banking by clicking on the ‘AutoShare Invest’ tab. How do I Redeem my Rewards Points into my Tax Free Investment Account? You can Redeem a minimum of 2500 Rewards Points (R250) into your Tax Free Investment account on the UCount Online Mall. You will only be able to Redeem in value increments of 2 500 Rewards Points (R250). You will first need to open one through the Standard Bank Online Share Trading (OST) platform. What happens if I don’t have enough Rewards Points to pay for my purchase? If you don’t have enough Rewards Points, you can always part-pay using your qualifying Standard Bank personal Credit, Cheque or Debit card or, if you can’t wait for your Rewards Points balance to grow, simply pay for your purchase in full using your qualifying Standard Bank personal debit, cheque or credit card. Which parking apps can I use my UCount Rewards card on for redemption? How do the parking app solutions work? Upon arrival at the entrance your license plate is scanned and the boom opened. The app will send a notification to your smartphone, informing you that the registered car is currently parked. Once you’re ready to leave, simply drive to the exit where your license plate is once again scanned and the boom opened. Can I load more than one car on the app? What name do I put on the screen that asks for “Name on Card” as the UCount Rewards Card is blank? Enter your initials and surname in this slot. Without the parking apps if your car is taken off your hands you will normally only notice at the end of your visit and will need to notify the centre management and the authorities. With the apps, you’ll receive a notification whenever your car leaves the centre. This way you’ll instantly know if something fishy is going on and can alert the authorities there and then. What’s more, centre management will also be able to pinpoint the exact time your car went out, meaning more accurate CCTV footage and a higher chance of recovery. Where can I get more information about the parking apps? How do I cancel my UCount Rewards membership? How do I re-register for the UCount Rewards programme? Re-registrations can be done online at www.standardbank.co.za/ucount or by calling the UCount Rewards Contact Centre on 0860 82 68 68. Are there any tax implications to being a member of UCount Rewards? Who can I contact if I have a query or complaint about the UCount Rewards programme? Points are paid out on deceased estates. Membership will be frozen upon notification of death of a member. The estate’s executor must provide a certified copy of the member’s death certificate as well as an official instruction. Rewards points can only be transferred to another nominated UCount Rewards member. If we do not receive beneficiary details within 24 months after the initial notification of death, all un-redeemed rewards points will be lost. We will send you an SMS with your rewards points balance each month, only if you have a minimum balance of 250 points. Log on this website using your username and password to download your rewards statement and to check your balance here. All Standard Bank customers can make purchases on the UCount Rewards Online Mall. Do I earn Rewards Points when I shop online? Yes, in addition to the up to 1.25% you collect on your Card transaction you also collect 3.75% in Rewards Points if you shop online on the UCount Rewards Online Mall (while logged on) using your qualifying Standard Bank Credit or Cheque Card. Do all Standard Bank Card transactions on the UCount Rewards Online Mall qualify for the 3.75% collection rate? Only online qualifying transactions will qualify for the collection, excluding spend on Airtime and eVouchers. What other transactions on the UCount Rewards Online Mall are excluded for the 3.75% collection rate? Charities, Avios & SAA, Saving & Investment (Autoshare Invest, Notice Deposit, PureSave and Tax Free Investment) redemption options on the UCount Rewards Online Mall are excluded from the collection rate. All Standard Bank customers, even if they are not Rewards Members are able to make purchases on the UCount Rewards Travel Mall. There is a wide range of products and services such as flights, accommodation, car hire and holiday packages available at competitive prices. Click here for more information. You must contact the Travel Help Desk on 0860 82 68 68 if you need to change or cancel your booking. An administration fee will be charged for any cancellation or change to your booking. No you cannot purchase a Visa with rewards points. You may use our Visa services on the UCount Travel Mall. You contact the Travel Help Desk on 0860 82 68 68 for any travel related emergencies. Why does Standard Bank charge a traveller support fee for bookings made via the UCount Travel Mall and what is it for? You can obtain the UCount Rewards Terms and Conditions by phoning the UCount Rewards Contact Centre on 0860 82 68 68 or by visiting any Standard Bank branch. To view the Terms and Conditions online, click here. It appears that fraudsters are using the name Standard Bank UCount Rewards in emails as an attempt to get hold of your personal and banking information – and ultimately your money. Please be on the lookout for emails that appear to come from us but do not. Phishing happens when a criminal sends you an email claiming to be from a recognized organization, for example, Standard Bank, to mislead you into revealing sensitive information for identity theft. This may be in the form of visiting a fake website or clicking on an email attachment. You are told to visit a website (made up to look like a Standard Bank site) where you have to enter sensitive information such as passwords, credit card details or bank account numbers. Once you’ve supplied your details, they are emailed to the fraudsters, and you are re-directed to the legitmate website. 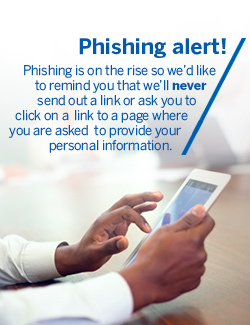 Phishing sites and emails often ask for information that Standard Bank would never ask you for or will ever ask you to update, such as personal or banking information. We will never send you an email with a link or attachment asking you to verify your login details, activate or re-active profiles or to register for additional security features. Please ignore and delete these emails. Please remember to be vigilant and NEVER give out your account ATM PIN, Internet Banking Logon credentials, UCount Rewards Logon credentials, Customer Selected Pin, One Time Pin, Card Number, Expiry Date and CVV2 or any other personal details. Always access our Internet banking service by typing the full URL (http://www.standardbank.co.za) into your browser. Never respond to an email asking for any of your details. Load the latest anti-virus software and personal firewall to your computer. We suggest any reputable anti-virus and personal firewall software such as AVG, McAfee, Panda and Symantec. We highly recommend that you make use of the additional security features such as Standard Bank’s MyNotifications and MyUpdates services. Be cautious if you use Internet cafés or a computer that is not your own. Download and install Trusteer software offered by Standard Bank. You can get it once you have logged into Internet banking. Trusteer offers comprehensive online security protecting login credentials and web communication from malware and preventing unauthorized access to ones accounts. Visit www.standardbank.co.za/secure for more hints and tips on secure banking. *including pro-rated fee for membership between registration and 1st debit order **Delivery charges are calculated based on the distance from our nearest depot located in the following city centres being Johannesburg, Cape Town, Durban, Port Elizabeth, East London to the chosen delivery address. When you register for UCount Rewards, you must choose a debit order date of either the 1st, 5th, 15th, 20th, 25th, 30/31st or last day of the month, to pay your membership fees. UCount Rewards membership fees are charged in advance for the month. To allow you to collect rewards points as soon as you are registered, we will add the pro-rated fee (for the days between registration and your debit order) to your first debit order, after which the normal membership fee will apply. Days are counted including registration day, but excluding debit order day. For example: If you register on the 25th of July and you choose to have your monthly debit order going off on the 20th of each month, your first debit order will only be taken off on 20 August. On that day you will be charged R0.7890 per day for the 26 days (from the 25th of July – 19 August) plus the normal monthly debit order fee of R24 for August. The total debit order value on 20 August will therefore be R44.51. From September onwards, you pay R24 per month. 3D Secure is an internationally recognised security standard that protects your card against unauthorised online use. Your card verification value (CVV) number is an anti-fraud feature to help confirm that you are the owner of the credit card being used to pay for transactions. For Visa/MasterCard, the three-digit CVV number is printed on the signature panel on the back of the card immediately after the account number. What is my UCount Rewards card’s 3D SecureCode? Your UCount Rewards card’s 3D SecureCode is a five-digit number that is used to authorise online transactions. You may need your UCount Rewards card’s 3D SecureCode to redeem your rewards points online at Participating Rewards Retailers. How do I get my UCount Rewards card’s 3D SecureCode? You can only get your UCount Rewards card’s 3D SecureCode by logging onto the UCount Rewards website, selecting ‘Manage my UCount Rewards Card’ and then selecting ‘Get my 3D SecureCode’. Why can’t the Contact Centre agent give me my UCount Rewards card’s 3D SecureCode? You can only get your UCount Rewards card’s 3D SecureCode from the website. The UCount Rewards Contact Centre does not have access to the functionality that generates 3D SecureCodes. Why is the 3D SecureCode process different for my UCount Rewards card and Standard Bank Cheque/Credit card? For UCount Rewards, you need to get your 3D SecureCode from the UCount Rewards website and need to remember it when redeeming rewards points online. If you forget it, you must get another one from the UCount Rewards website. For Standard Bank Cheque and Credit cards used for online transactions, a one-time PIN (OTP) is given to you as part of the transaction. What is the difference between my 3D SecureCode for my UCount Rewards card and the one-time PIN (OTP) for my Standard Bank Cheque/Credit card? The UCount Rewards card uses a 3D SecureCode for online transactions. Standard Bank personal credit and cheque cards use a one-time PIN (OTP) for online transactions. Why can’t I use my UCount Rewards card to pay for transactions on the UCount Rewards Online Mall or Travel Mall? The UCount Rewards Online Mall and Travel Mall are linked directly to your UCount Rewards member profile. You can use your balance through this link to pay for online transactions. Why can I use my UCount Rewards card online but not my Standard Bank Debit card? Standard Bank Debit cards are not embossed and do not have all the security features needed to do safe and secure online transactions. Part payments allow you to use your rewards points and another payment method; for example, credit card or cheque card, to pay for your online transaction if you do not have enough rewards points. Can I do part payments online at Incredible Connection and Makro? No. Currently, part payments online cannot be done at Incredible Connection and Makro. This functionality is being developed and we will let you know when you can use it. It is important to know your rewards points balance before trying to redeem your rewards points online at Incredible Connection or Makro. What happens if I don’t have enough rewards points to redeem online at Incredible Connection and Makro? Your transaction will be declined. You can get your rewards points balance by logging into your profile, calling the UCount Contact Centre, on the Standard Bank mobile app or you can SMS Balance to 45224. SMS costs R1. When completing a 3D secure payment using my UCount Rewards card, what details do I fill in under “card holder name”? When making an online purchase with your UCount Rewards card you may be prompted to enter cardholder details or cardholder name. Your UCount Rewards card does not have your name printed on it; therefore you must enter your name and surname. How long is my UCount Rewards Card 3DSecureCode valid for? Your 3D SecureCode does not expire. It is important to remember your five-digit 3D SecureCode. What happens if I forget my UCount Rewards card’s 3DSecureCode? Logon to the UCount Rewards website, select ‘Manage my UCount Rewards Card’ and then select ‘Get my 3D SecureCode’ and a new 3DSecureCode will be generated. What if my UCount Rewards card is lost, stolen or damaged? You need to cancel your UCount Rewards card immediately. You can do this online or you can call UCount Rewards on 0860 826 868. Do I need a new 3D SecureCode for a new or replacement UCount Rewards card? Yes. If you cancelled your UCount Rewards card because it was lost, stolen or damaged and it was activated, you need to get a new UCount Rewards card and 3D SecureCode. You can only get your new UCount Rewards card’s 3D SecureCode by logging onto the UCount Rewards website, selecting ‘Manage my UCount Rewards Card’ and then selecting ‘Get my 3D SecureCode’. Do I pay to view my 3D SecureCode on my online profile? You are not charged a fee to view your UCount Rewards card 3D SecureCode. Do I pay to get a new 3D SecureCode if I forget it? You are not charged a fee to get a new 3D SecureCode. Is collecting rewards points from Participating Rewards Retailers online different from collecting them in-store? Do I need to use my UCount Rewards card’s PIN for online transactions? No. Your UCount Rewards card‘s PIN is only used for in-store purchases. Do I also need to use my 3D Secure Code to redeem rewards points in-store? No. Your UCount Rewards Card 3D SecureCode is only used for online purchases. Do I need to use my one-time PIN (OTP) for online purchases? No. The OTP we send you is only used when we need to confirm that you are making changes to your UCount profile, PIN or getting a 3D SecureCode. How do I get refunds for my online purchases? Refunds cannot be made to your UCount Rewards account/profile. Refunds are done in line with the Participating Rewards Retailer’s refund process. Who do I contact if I have queries about an online purchase? Do I get tiering Points for having a Standard Bank Mobile SIM card? Yes, you get 50 tiering points for having an active Standard Bank Mobile SIM card. Do I get tiering points for purchasing prepaid airtime/data for my Standard Bank Mobile SIM? Yes, your qualifying prepaid purchases for your Standard Bank Mobile SIM using the Standard Bank app, Internet banking,cellphone banking and/or the ATM qualify for tiering points. Is the data I get per tier on UCount Rewards over and above the tiering points I get for the Standard Bank Mobile SIM? Yes, in addition to getting tiering points, you also receive data every month based on the tier that you are on. How much data do I get per month for having the Standard Bank Mobile SIM? What are the other benefits of a Standard Bank Mobile SIM? Get the equivalent or more of your banking account fee back in airtime. You also get 1MB for every R10 spend on your Debit/ Cheque and Credit card swipes at point of sale. Do I need to sign a 24-month contract with Standard Bank Mobile? Where can I get more information on Standard Bank Mobile and the offering?